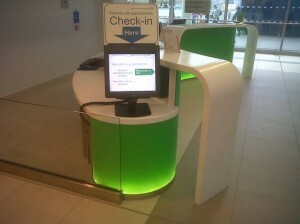 In conjunction with its healthcare partners, Cammax have installed several Clearview kiosks into Pembury Hospital. Working through the night, Cammax technicians installed the kiosks out of normal outpatient hours to minimise disruption to patients and hospital staff. Patients can register their attendance for their appointments on the kiosks, which saves the Hospital a considerable amount of money in Hospital personnel and administration costs. Patients have the choice of registering using two methods, via entering their personal details, or using their appointment letter. The patient’s appointment letter has a unique barcode reference printed on it. Cammax manufactured the Clearview kiosks with in built omni-directional barcode scanners, so that patients who bring their appointment letter, which have a barcode on them, can scan their letters at the kiosk. The barcode method of patient registration using self service speeds up the process substantially and also frees up Pembury Hospital staff.